* International size indoor school – 66 x 24.5 metres with a Cushion cm Track surface – the highest quality surface currently available. Being well lit and spacious with a first class P.A. system and great acoustics, this indoor arena is of the highest standard. 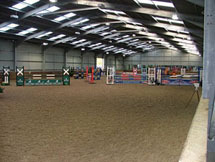 * 2nd Indoor school – 70 x 30 metres with a Cushion Track surface and spectators gallery. * Floodlit outdoor school – Measuring 60 x 20 metres surfaced with EQ Surfaces Wax Track with panoramic views of the surrounding countryside. * Floodlit outdoor jumping arena – Measuring 60 x 30 metres with EQ Surfaces waxtrack. 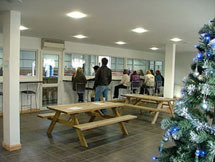 * Indoor viewing area with showers and toilets. * Restaurant – serving hot and cold food and drinks. * Car and lorry park – There is plenty of hard standing parking to enable your horse to remain clean between un-boxing and whilst going to and from work.